Renowned Mathematician, Professor Francis Kofi Ampenyin Allotey, 85, is reported to have passed away Thursday night after complaining of discomfort. A family member, Sarah Ofei, told Peace FM, the professor passed at about 10 pm after he was rushed to the hospital. “Around 10 am Thursday morning he complained he did not feel well so we sent him to the hospital,” she said. The Nuclear Physicist was discharged the same day, but the family rushed him back to the hospital after the discomfort resurfaced in the evening. “In less than 30 minutes after arriving at the hospital, he passed on”, she said. Mrs Offei said Ghana’s first professor of mathematics was not sick and was preparing for a UNESCO conference on Saturday where he was to be honoured. Prof. Allotey born in 1932 in Saltpond in the Central region took a passion for science after reading books on scientists sold by his father. In a March 2017 interview at Imperial College in the UK where he completed his first degree in 1950, Prof Allotey said after class was over, he had to go help his father to repack the books. ‘I was drawn to those about science and the big names in science who were explaining the universe; Einstein, Hubble, Eddington….I read it and thought I have to be a scientist so that I can also explain the workings of the universe’. It was at Imperial College that he met his mentor – Professor Abdus Salam. After completing an education at Imperial College, he would go on to gain advanced degrees at Princeton University before returning to Ghana to become the country’s first full Professor of Mathematics at the Kwame Nkrumah University of Science and Technology. There is a theorgy named after him – the Allotey Formalism which is a technique used to determine matter in outer space. He was President of the African Institute for Mathematical Sciences, Ghana, President of the Society of African Physicists and Mathematicians, a founding fellow and former vice President of the African Academy of Sciences. He was also Vice President at Large of the International Union of Pure and Applied Physics and former President of Ghana Academy of Arts and Sciences. 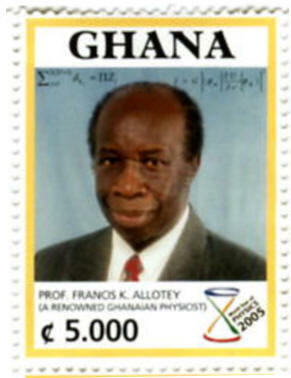 To recognize his achievement to the promotion of science development, the government of Ghana issued a postage stamp with his portrait. I am lucky. I’m lucky that I had my father’s bookstore and I was able to read biographical books of scientists. ‘Then I had good mentors who made me a better student. They became my friends – they were very welcoming, even one professor inviting me and my wife to his house in Surrey’.